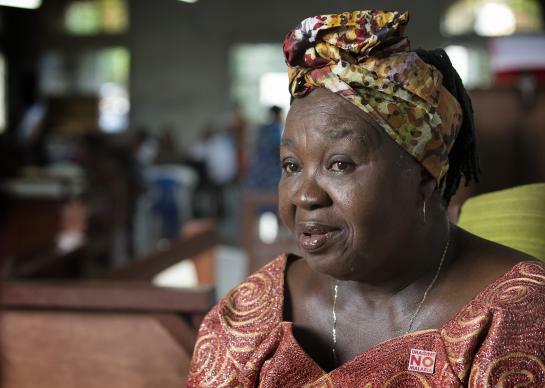 Beatrice Gbanga is medical and health coordinator for The United Methodist Church's Imagine No Malaria campaign in Sierra Leone. The morning light washed over the grey concrete walls and through the large white, wrought iron-covered window behind the altar of Charles Davies Memorial United Methodist Church on Sunday, June 1. At 9 a.m., the soft light touched the faces of the Rev. Mabel Ann Kainyonde and the Rev. Georginia E.M. Maligi, sitting at the front of the church patiently waiting for Sunday services to begin at 10 a.m.
Worship at Charles Davies Memorial United Methodist Church on Sunday, June 1. The church is new and still getting finishing touches. The large window, which perfectly frames the back of the sanctuary, has a United Methodist cross and flame at its peak. The ornate design looks like stained glass without the glass and offers an open-air view of the community behind the church. The church is named for Charles Davies, a young man who died in a car accident. The land for the church was donated by his grieving father, and the parishioners named the church in honor of the son. By 10, the wooden pews along the sides of the church are filled. At 10:30, church members scurry to bring in plastic chairs as the congregation swells on this Ascension Sunday. Shy, a bit scared, Peter Jusu, 8, takes his first solo turn at reading Scripture in front of the church. At the end of the service around 12:30 p.m., the children who had been downstairs in the basement for Sunday school stream in from the back door to fill the front of the church. They are drilled on what they learned in church and all leave with two candy lollipops. “They are happy, happy children,” says the Rev. Sahn E.K. Fallah, pastor, as he watches them walk out to join with their families. Several members of the congregation are involved in a campaign that will begin distributing integrated long lasting insecticide nets next week in the city of Bo. From the pulpit, Fallah also expressed his appreciation. The United Methodist Church through its Imagine No Malaria program is, this June, partnering with the Sierra Leone government for the second time to supply treated nets nationwide. The first ever successful mosquito net campaign was conducted in Sierra Leone in November, 2010. The 2014 campaign will replace or supplement the nets given to families in 2010. The distribution of nets in Bo will be conducted June 5-June 14 and will be followed by the “Hang-Up” campaign nationwide from June 25-29. Health workers will also administer Albendazole tablets and vitamin capsules targeting children under 5 years and assist with mass distribution of nets to all households in the country. The goals of campaign are to make sure 95 percent of children from age 6- to 59-months get Vitamin A supplements; 95 percent of children 12-59 months get Albendazole tablets; 100 percent of the population get insecticide-treated mosquito nets. “If you have even said a prayer for the success of this program, we want to thank you,” said Gbanga. Gilbert is a multimedia reporter for United Methodist News Service in Nashville, Tenn. Phileas Jusu, director of communications for The United Methodist Church in Sierra Leone, contributed to this report.